2 reviews of donguri, first by judyptsai. best japanese in the city. unique, well-crafted dishes from duck breast to fish head! very small, cozy room, no reservations accepted. These dishes from the donguri menu are contributed by Menuism users directly, as part of a restaurant review, or as part of a photo upload. Do you own donguri? Contact us to connect with your diners. 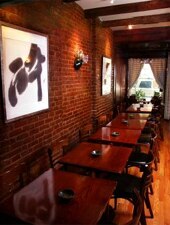 donguri is located near the cities of Tribeca, Peck Slip, Canal Street, Trinity, and Financial District. People found this by searching for: Donguri Restaurant Groupon, Donguri Menu, Donguri 83rd Menu, Donguri Ny Menu, Donguri Upper West Side, Donguri Menu Pages, and Menupages Donguri.